From left to right, Capt. 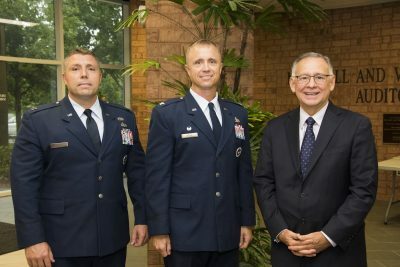 Joseph Walters, assistant professor of Aerospace Studies; Col. Jason Patla, Detachment commander; and Neal P. Mero, Ph.D., dean and professor of Management in Stetson’s School of Business Administration welcome Air Force ROTC to Stetson’s DeLand campus. Stetson University is joining forces with the Air Force Reserve Officer Training Corps (AFROTC) to bring the program to Stetson beginning Fall 2018 semester. The university and Stetson’s School of Business Administration are partnering with AFROTC Detachment 157, one of the largest AFROTC programs and one of the top pilot-producing detachments for the Air Force in the nation. Air Force ROTC is an elective program taken alongside a student’s planned major course of study. Current Stetson University students may join the program as cadets beginning in spring 2019, with incoming first-years likely joining the program beginning in Fall 2019. AFROTC students enjoy all the aspects of campus life with the added benefits of enhancing their skills in the science of air power and the art of leadership. Mero served in the Air Force for over 22 years and held positions as a systems development program manager at Norton Air Force Base in California, director of missile operator training for the U.S. Air Force while stationed in Great Falls, Montana, and as a faculty member at the United States Air Force Academy in Colorado Springs, Colorado. The AFROTC is an educational program designed to give men and women the opportunity to become Air Force officers while completing their degrees. The program prepares students to assume positions of increasing responsibility and importance in the modern Air Force. Stetson is one of five campuses now offering the AFROTC Detachment 157 program, hosted at Embry-Riddle Aeronautical University in Daytona Beach, above. Stetson students may now pursue an Air Force ROTC military education and commission alongside their traditional Stetson education. Select students may enter Stetson on an ROTC scholarship and any active Stetson student can also apply to become a ROTC cadet as late as midway through their sophomore year. Cadets who qualify can compete for scholarships during the spring of their first year and fall of sophomore year. Once they become juniors, all cadets receive a stipend of approximately $450-$500 per month. 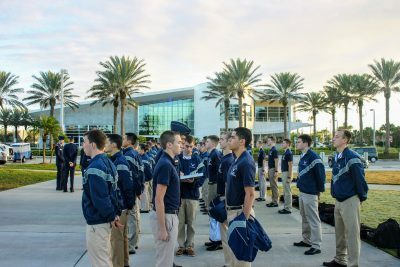 The AFROTC Detachment 157, hosted at Embry-Riddle Aeronautical University in Daytona Beach, is one of the largest detachments in the country and produces the most officers of any AFROTC unit. Stetson University is one of five campuses now offering the AFROTC Detachment 157 program.